When you’re working hard, it can seem impossible to strike an effective balance between your professional and home life. Modern technology means we’re almost always contactable, which can make it very difficult to switch off from work. It is important to achieve a lifestyle where you are still working to your career objectives without putting your life on hold. In turn you will improve your physical and mental wellbeing, and boost your performance at work, by helping you relax and improve your morale. If you’re struggling to balance work-life commitments, why not ask for flexible working? You may be able to customise your working week to better-suit your lifestyle, family commitments, or spend time on your life goals. Your employer may be open to flexible working, and you may be able to work your full hours across fewer days, as long as your standards remain high. Joining a gym or starting a new sport or hobby is a good way of releasing stress. You will not only have something fun to look forward to, but you’ll meet new people as well. You won’t have time to build a strong professional network if you are constantly at work, so improving your work-life balance could also improve your career prospects. Where possible, try to leave work on time. It might be tempting to stay a little late to finish things off or get ahead for tomorrow, but you’re eating into your family and social time and putting your life on hold. Time management is a skill many professionals should develop, otherwise you’re perpetuating a bad habit and one that can be difficult to break. Many professionals fail to take their full allowance of annual leave each year. With so much to get done at work, they choose not to take their full entitlement to continue working. In the long term, this increases the risks of fatigue, loss of morale and reduced performance. You might think that skipping breaks enables you to get more work done, but in fact it can have the opposite effect. Breaks are an important form of rest and recuperation, and can help bring a new perspective to problems. If you have short breaks at regular intervals, it helps keep your energy levels high and retain your focus. The same goes for skipping your lunch break. If you try and power through without resting your brain, it’s inevitable that your productivity and quality of work will tail off. If you plan ahead for the next day, or the next week, you should be able to limit the number of extra hours you spend at work. Aim to put together a priorities list and tick off the tasks as you complete them - this should help keep your focus. If you continually react to evolving events, you will find yourself still working well into the evening. 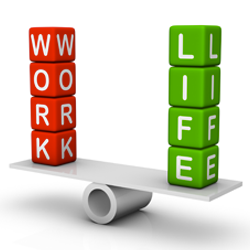 There isn’t one solution to a good work-life balance, but it is important that you find a way that works for you.